This is one of the simplest and most ingenious ideas to come along in a long time. It’s caught the attention of the United Nations and others. 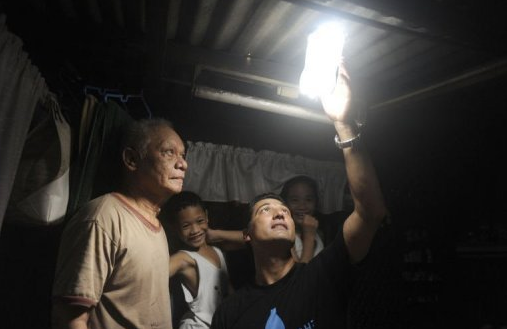 Here is the article from AFP explaining Filipino entrepreneur Illac Diaz has figured out a way to used discarded soft drink bottles to light homes for free during the day. Very intriguing indeed. MANILA — Filipino entrepreneur Illac Diaz is aiming to help a million poor people in a year, and with the help of some plastic bottles and a clever social media campaign may do even better. Diaz’s project appears simple — fill discarded soft drink bottles with water, place them in roofs of houses and allow the refracted light to brighten homes during the day instead of using electric bulbs. However, what began as a small-scale effort in a Manila slum early this year has quickly spread throughout the Philippines and even into impoverished communities as far away as Colombia, India and Vanuatu. It has also earned Diaz accolades from the United Nations, which will bring him to its climate change summit in South Africa next week to show world leaders how “solar light bottles” are helping to tackle global warming. “This has blown us away,” Diaz, head of MyShelter Foundation, told AFP of the international reaction to the project that is in part due to a powerful YouTube clip and smart use of social media sites such as Facebook.